Land/Cruise only price does not include arrival/departure transfers. Mar 14, 25 & 28 departures end in Passau instead of Regensburg. Budapest to Regensburg: Passengers returning from Munich on Day 11 should select flights that depart no earlier than 11:00 am. The Munich airport is approximately a 1.5 hour drive from the Regensburg port. 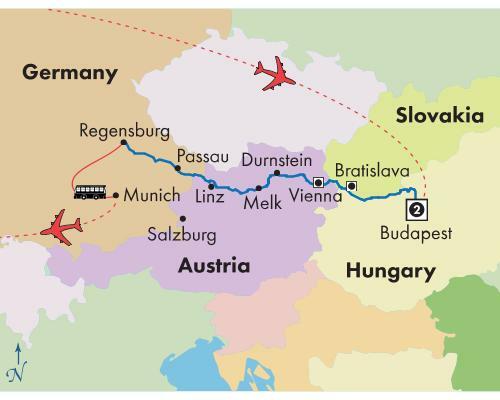 Regensburg to Budapest: Passengers arriving to Munich on Day 2 should select flights that arrive no later than 2:00 pm. Transfers to Regensburg will depart at approximately 9:00 am, 11:00 am, 1:00 pm and 3:00 pm. The port is approximately a 1.5 hour drive from the Munich airport. Embarkation will begin at 2:00 pm. Budapest to Passau: Passengers arriving to Budapest on Day 2 should select flights that arrive no later than 3:00 pm. Passengers returning from Munich on Day 9 should select flights that depart no earlier than 11:00 am. The Munich airport is approximately a 2 hour drive from the Passau port. Passau to Budapest: Passengers arriving to Munich on Day 2 should select flights that arrive no later than 2:00 pm. Transfers to Passau will depart at approximately 9:00 am, 11:00 am, 1:00 pm and 3:00 pm. The port is approximately a 2 hour drive from the Munich airport. Embarkation will begin at 4:00 pm. Due to physical constraints and space limitations, wheelchairs and walkers are not allowed on motor coaches and/or river cruises. There are no elevators or chair lifts on board. Kindly refer to our Terms for additional information. While sailing with Monarch Cruises, passengers are subject to the cruise's Terms & Conditions.